David Hockney's creative genius embraces the performing, as well as the visual, arts. His first stage commission was for a production of Jarry's Ubu Roi at the Royal Court Theatre in London in 1966. In 1974 he designed his first opera, the highly acclaimed Rake's Progress by Stravinsky for Glyndebourne. A second collaboration with Glyndebourne followed, on Mozart's Magic Flute (below) in 1978. I remember sitting in the audience that year wearing the de rigeur Glyndebourne uniform of dinner jacket, Hockney was in the row behind wearing a tee shirt and a non-matching pair of old trainers. Other notable stage commissions included triple bills of Satie, Poulenc and Ravel (Parade, Les Mamelles de Tiresias and L'enfant et les sortilèges) and Stravinsky (Le Rossignol, Le Sacré du Printemps and Oedipus Rex) in 1981 for the Metropolitan Opera in New York, Wagner's Tristan und Isolde for the Los Angeles Music Centre, Puccini's Turandot in San Francisco and Strauss's Die Frau ohne Schatten at Covent Garden. Programme playlist from Private Passions by Michael Berkeley, published by Faber. 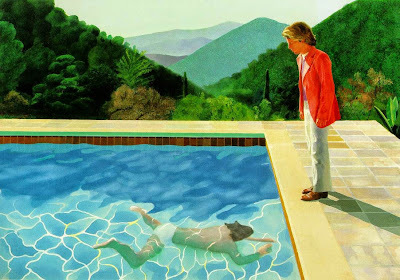 David Hockney's Portrait of an Artist (Pool with Two Figures) comes via WebMuseum, Paris. Any copyrighted material is included as "fair use" for critical analysis only, and will be removed at the request of copyright owner(s). He will be touring the UK next week, with the Katia Labèque Band. Do you know him? I do. A Great Musician. Just have a look at his discography. Would anybody tell me how to authentify drawings and watercolors from David Hockney, and if a contact with the artist is possible?